I used to run into this with TIFF images when building websites. (No big surprise, given that there are a million variations on the TIFF format.) I think it was around 2000 or so that I was working on a website for a law firm, and they sent me their logo. The logo, as I received it, was yellow on light blue, so I built a site with black text on a white background for the main areas, and yellow on light blue (matching their logo) for the title, navigation, and borders. I sent them a link to the test site. They looked at it, and said it was very nice, but could I try to match the color scheme on their logo instead? It turned out that red and blue had gotten switched around (and possibly more, because I can’t remember how the yellow ended up in there), but anyway it was supposed to be white on light brown. I switched the channels, redid all the graphics and styles for the site, and they stuck with it for several years. Back on the subject of Coraline, Gaiman adds in his post that the film has become “the second highest grossing stop-motion film ever” after Chicken Run. So why does it seem to be forgotten already? Just two months ago, commentators were falling all over themselves to say Coraline was the turning point for 3-D animation being part of the storytelling and not just a gimmick. Now everyone’s talking about how Monsters vs. Aliens is the turning point for 3-D animation being part of the storytelling and not just a gimmick. This entry was posted in Highlights, Sci-Fi/Fantasy, Web Design and tagged Coraline, graphics, Neil Gaiman on April 19, 2009 by Kelson. This entry was posted in Sci-Fi/Fantasy and tagged Coraline, movies, Neil Gaiman, Tweets on March 25, 2009 by Kelson. Beetles are delicious creatures that live close to home. If you use beetles from your backyard or basement, check them for shiny and fully developed thoraxes (beetles still in larval stage will be chewy and bland). The most mouth-watering kind, with translucent shells and large veins, can be found in the forests of Zanzibar. It’s so perfectly Martha Stewart for the Macabre. 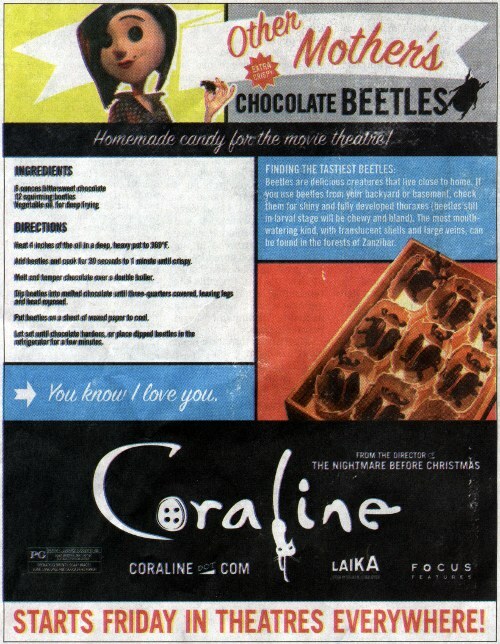 This entry was posted in Sci-Fi/Fantasy and tagged advertising, Coraline, movies, Neil Gaiman on February 4, 2009 by Kelson. YouTube also has the trailer in HD. I discovered Sandman late, borrowing the trades from one of my (younger) brother’s friends around 1998 or so, then immediately tracking down my own copies. I lucked out and got a complete set on eBay for something like $70. Since then I’ve devoured most of Neil Gaiman’s work, be it in comics, prose, or movie form. 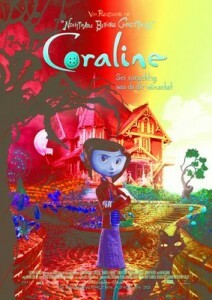 The original novel of Coraline was very good, and it’s been adapted by the director of The Nightmare Before Christmas, which is among my favorite movies…and what I’ve seen of the film suggests that they get it. It’s hard to believe it’s only two weeks away! Other movies: Oddly enough, I’m only mildly interested in Terminator: Salvation, Transformers 2: Can’t Remember the Subtitle, Harry Potter and the Half-Blood Prince (the films have been steadily deteriorating after peaking with #3, IMHO), Star Trek, and Watchmen. I’ll probably see all of them, but none of them have me nearly as excited. This entry was posted in Comics, Music, Sci-Fi/Fantasy and tagged Battlestar Galactica, Butterfly Boucher, Coraline, Cross-Post, Fallen Angel, Flash Forward, Neil Gaiman, Robert J. Sawyer, Robert Jordan, Scott Pilgrim, See Also: Speed Force, Terminator, Tori Amos, Vertical Horizon, Warren Ellis on January 27, 2009 by Kelson.